Yellow Springs team members Angelina Smith and Emma Ronnebaum go up to block a shot, during a recent home game with Legacy Christian Academy. Smith and Ronnebaum have both been instrumental in the Bulldogs’ 4-0 season opening record. YELLOW SPRINGS — The Yellow Springs girls high school volleyball team opened its season at Springfield High School on Aug. 20. The Bulldogs may have a small team this year but they are mighty. Despite getting off to a slow start dropping the first set 19-25 they found their rhythm in the second set as they went on to sweep the next three games from the Wildcats 25-21, 25-20, 25-21. Leading the Bulldogs was senior, Alex Ronnebaum, with five kills, an assist, 11 blocks and five digs. Sophomore, Emma Ronnebaum, was close on her sister’s heels with one ace, 10 kills, 10 assists, five blocks and 14 digs. Junior Tyler Linkhart had an ace, 10 kills, 16 assists, five blocks and 14 digs. Also contributing were sophomore Annlyn Foster with two aces, 12 digs and four blocks; freshman Angelina Smith with a pair of aces, 18 digs, three blocks and two kills; another freshman, Aaliyah Longshaw, with 17 digs and three kills; while junior Olivia Snoddy had four digs and a kill. 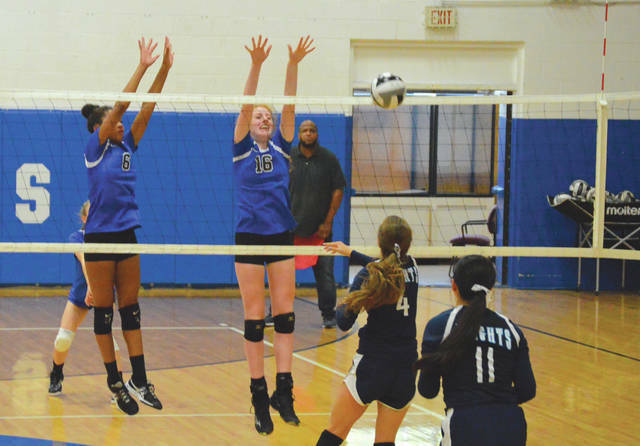 On Aug. 23, the Bulldogs had another away match, opening Metro Buckeye Conference play at Troy Christian. The Eagles are a big conference rival, but they proved no match for the Bulldogs who won in three straight sets 25-17, 25-14, 25-18. Foster led the Bulldogs with two aces, five kills and 13 digs. Alex Ronnebaum came up big again with an ace, eight kills, three blocks and five digs. Linkhart pounded down nine kills along with four aces, 17 assists, a block and 10 digs. Emma Ronnebaum also helped the cause with two aces, nine kills, five assists and 10 digs. Longshaw had six digs while Smith added nine digs and a block. On Aug. 25, the Bulldogs hosted Bethel in a non-conference match. The Bulldogs won in three straight sets 25-16, 25-18, 25-23. Once again, the whole team contributed to the win with each player putting points on the scoreboard for the Bulldogs. Linkhart started the match off with 10 straight serving points three of which were aces. In total, Linkhart had eight aces, 15 kills, 12 assists, eight digs and four blocks. Alex Ronnebaum had an ace, 10 kills, one block and two digs while Emma Ronnebaum added eight kills, six assists and nine digs. Smith dug up 10 balls and Longshaw had three digs to go with three assists. Snoddy also added three digs in the Bulldogs’ victory. Yellow Springs now 4-0 overall and 2-0 in the Metro Buckeye Conference after a recent Aug. 27 win over Legacy Christian (25-10, 25-10, 25-20). They hosted Middletown Christian on Aug. 30, but no score was yet reported. The Bulldogs travel to Springfield to face Emmanuel Christian, the defending 2017 MBC champions, at 6 p.m. on Tuesday, Sept. 4. Story provided by YSHS girls volleyball coach Christine Linkhart.